Lab manager Michelle Parks works on an experiment in the Klavins Lab. 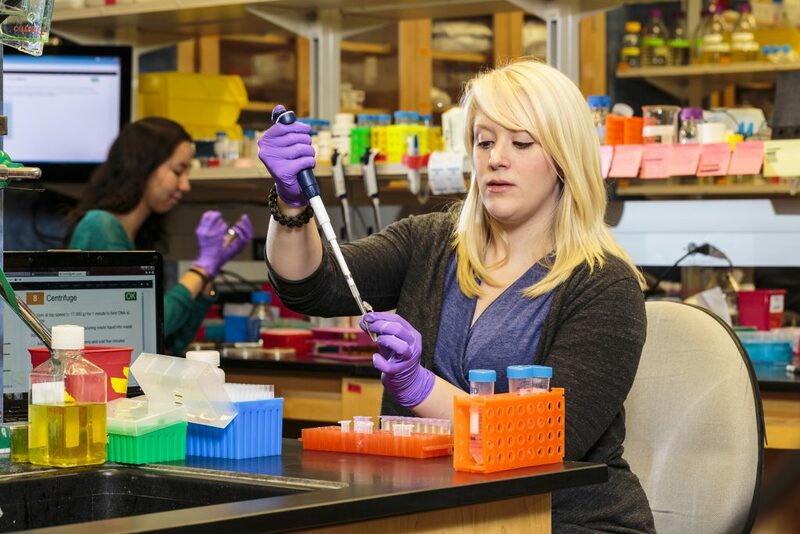 Conducting research in a synthetic biology lab entails collecting, analyzing and sharing large amounts of data. Until recently, lab notebooks and lab reports were the universal method for collecting data and detailing procedures, including instructions for replicating studies. Due to varying data-recording methods, the duplication of experiments was often unpredictable. Desperate to improve the repeatability of laboratory protocols, Associate Professor Eric Klavins developed a new digital method to improve and standardize data documentation in his own lab. His solution led to a new start-up, Aquarium, LLC, which is improving the way people document and share data. Leveraging his background in robotics, automation and programming, Klavins designed software with three different components, which enables technicians to reliably perform lab work, analyze data and share experiments. The first component is the Aquarium Operating System, which is a cloud-based laboratory operating system designed to enable biotechnology researchers to quickly and easily develop and execute experiments that are highly reliable to reproduce. The second component, Aquarium Analytics, leverages the data generated to provide users with highly accurate predictions for any given experiment, including costs, the time it will take to complete and the probability of success. Finally, users can share experiment workflows and protocols using Aquarium Exchange. Because it fosters a high level of reproducibility, Aquarium enables researchers to design and execute complex projects, such as the construction of advanced genetic circuits, in weeks instead of months. After developing the Aquarium software, Klavins implemented it in his lab and shared it with other researchers at UW. Following discussions with researchers at other universities, he soon realized there was a large, unmet demand for the software. The process of taking the software to the market was possible through assistance from UW’s commercialization center, CoMotion. After refining their product and creating a plan to take to investors, Klavins and co-founder Mark Merrill, of Griffin Securities, received a 2015 CoMotion Innovation Fund Award, which provided funding to help launch the product. CoMotion also worked with the Aquarium co-founders to establish an exclusive license to commercialize the Aquarium intellectual property. In addition to the two co-founders, Aquarium currently employs two employees, one of whom is a UW Electrical Engineering graduate student. Working closely with early adopters of the system, the company continues to refine the Aquarium software. Aquarium helps researchers design better experiment workflows and share them with other labs.